I’d settled on ordering a shrimp entree with a calamari starter moments before Dr. Maya Angelou’s limo pulled up to the Melrose Avenue restaurant. I sat at the “star” table alongside Norman Lear (the iconic creator of All in The Family, The Jefferson’s, Maude, and a slew of other TV sitcoms in the 80’s), who’d invited me to be a part of his production team on a TV talk show he developed for Maya to host. On his way to meet her car, Norman doubled back. Announced that she had a dreadful allergy to shellfish. Couldn’t be anywhere near it. “Uhm, make that a Chicken Caesar!” I said to the waiter in my super sotto voice. Breaking bread with two literary geniuses was a divine gift. The afternoon was relaxed, informative, historic, and at times a bit loud. Everyone seated around us, including a former colleague who stopped giving me the time of day years earlier, were envious. Yes! The fellowship spilled into the night when Maya invited us to dinner at her brother’s home. Norman couldn’t make it, but I had a blast. She shared stories about her brief stint as a dancer with the Alvin Ailey troupe, her brothel days, her passion for words, her love for her brother, and her apprehensions about committing to a live, five-day-a-week talk show—a foreshadow of Norman’s and my worst fears. A month or so after the lunch—February 14th, 1993 to be exact—I reunited with Maya in a New York Midtown rehearsal hall. She was preparing her spoken word performance with Ashford & Simpson for later that night at a sold-out Paramount Theater concert. I filmed most of the rehearsal. Once they wrapped, I pulled Maya aside for our video interview. “Keep it short! We’re already late,” her assigned handler snapped. What??? I’d flown in specifically for the interview and waited patiently the whole day. I was going to take my time and get what I came for! As the interview went on, I could peripherally see the handler pacing the floor, staring at her watch, sighing. It threw me off my game. I uncharacteristically stammered through my questions until I got the “wrap it up” sign from her. 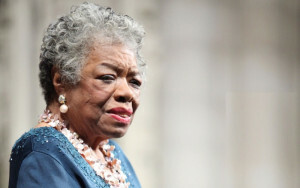 I dropped my last questions and thanked Maya for what she’d given me. “I’ll see you later tonight,” I said, defeated. “But we didn’t finish, did we?” Her tone disturbed. “No, child,” she said. “Stop. You’re not sure. You can’t ever be sure of anything. Remember that. You don’t know how this interview will get used, in perpetuity. Cover your bases. Stick to what you planned. If it’s important to YOU, then it matters. YOU matter. What you do matters. They’ll wait. Never forget that.” I never have. It was a career-changing lesson taught in the simplest words. Maya was good that way. We went for more than twenty additional minutes. One question sparked another and another. Maya offered several times later that it was one of the best interviews she’d given—one that I almost didn’t finish. Later that night, I wished Maya a great show backstage then took my seat front and center. As I looked around me in the packed theatre, something seemed odd. I couldn’t place my finger on it at first. After a while, I noticed that everyone was paired up—like on the ark. Duh! The concert that featured Maya, Ashford & Simpson, Isaac Hayes, and Freddie Jackson was a Valentine’s Day FOR LOVER’S ONLY show. How’d I miss that? I felt like a fool sitting there all alone as balloons and every other kind of love image dropped in front of me. But leave it to Maya—when it was her time on stage, she saw me sitting alone, uneasy, looking like an Old Maid amidst all the couples. So, she broke away from the others, stood center stage, and performed directly to me. What a class act! LESSON LEARNED: Don’t be easily intimidated or you’ll miss the gold as I almost did. *Look for more of my interview with Maya, plus other stories and lessons learned from notables that I’m compiling for my book, AND THEN WHAT HAPPENED? For updates, subscribe to my RSS feed or visit: www.shirleyneal.com.